Of course, fans of the widely recognized, 37-year-old “X-Men” comic book series can tell you all of this in their sleep. The only thing they probably couldn’t describe successfully is the whole involved story behind the mutants. I should know; I was a fan of the series for many years, and even in my experience, there is difficulty keeping all of the characters and storylines straight. Their complexity is sometimes so extreme that we often get lost in the details. This would be the first problem to tackle with any film adaptation, and thankfully, Singer, who was the director of “The Usual Suspects,” assures that the opening chapter of the X-Men’s screen career is one with a clear, concise and simple narrative, without it ever getting boring or boggled down by a vast amount of characters or direct comic references. And in accession, the film supplies one of the most exciting thrill rides at the theater this summer. In the opening shot, audiences are transported back to Poland, 1944, presumably the first place where this genetic breakthrough is seen. A young child is separated from his parents by Nazi’s, locked behind a metal gate wrapped in barb wire. As he struggles to free himself of their grasp, his hands, pointed in the direction of the metal, begin to twist and shape the barb wire without any direct contact. The guards are astounded, but unaware of who, or what, has induced this astounding feat. That child grows into the looming figure of Magneto (Ian McKellen), a man twisted by his past, who believes that normal humans should be eliminated and surrogated by his own kind. In the opposing corner is Charles Xavier (Patrick Stewart), a telepath who heads a school devoted to teaching mutants how to handle their gifts. He and Magneto grew up together, but Xavier, unlike his friend, did not experience the horrors of World War II, and is therefore not shaped by hatred for mankind and its prejudices. His dream stands firm—one day, both mutant and human could live together in peace and harmony. That dream, needless to say, is far beyond the horizon, as both Xavier and Magneto have formed their own teams of mutants, who share similar beliefs and are at constant war with each other regarding the future between mutants and ordinary humans. Undoubtedly you’ll recognize most of the team members: Magneto’s consists of the eccentric Toad, the shape-shifting Mystique, and the brutally challenging Sabretooth; Xavier’s contains the developing telepath Jean Grey, the conceited but energetic Cyclops, the supremely powerful Storm, and newcomers Wolverine and Rogue. Their on-screen tasks remain the same as those of the comics—to fight for their own beliefs and for the pursuit (or even decimation) of peace and serenity between Homo-Superiors and Homo-Sapiens—but they seldom take the challenge seriously, throwing themselves into the fray with such little forethought that we understand why their leaders encourage rehearsing combat. As Magneto prepares a plot to unleash a machine onto the free world that will convert normal humans into mutants (and, as a side effect, kill them), sides clash like two speeding cars in the same freeway lane. Only problem is, the master of magnetism needs a battery for his machine, and his eyes are on the recruited X-Man Rogue, whose powers allow her to absorb anyone’s energy simply by touch and, in some cases, unleash them in greater amounts. 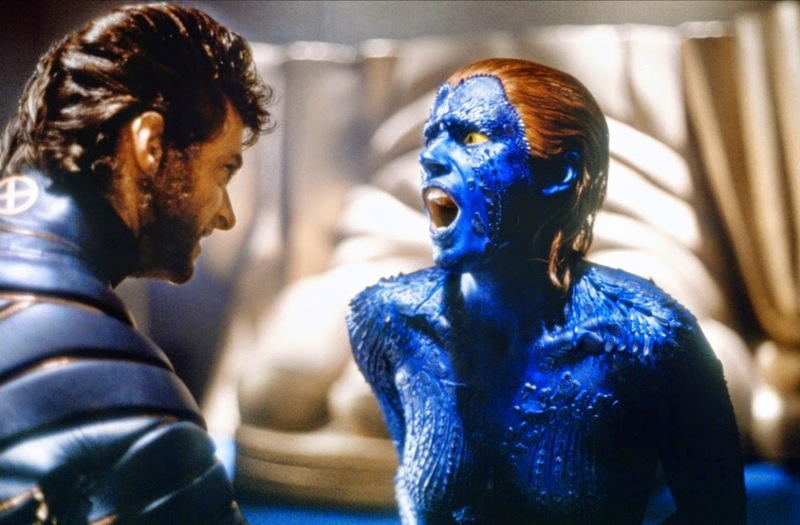 The special effects artists have utilized their technological freedom so well that, at instances, “X-Men” deserves comparison to last year’s masterwork “The Matrix.” The fight scenes are staged with unorthodox choreography, in which the fighters defy laws of gravity and use their superhuman strength to assess them (in one scene, Jean Grey uses her mind power to keep Toad suspended in midair as he jumps towards her). And as I was watching a cloud of energy sweep across the waters near Manhattan from on top of the Statue of Liberty, where the climax takes place, I remember thinking how beautiful the cinematography was, how precise the editing was, and how well the excitement builds as the events unfold. Most generic action films promise great things with big and loud beginnings, then run out of steam before any climax arrives. Here is a movie that isn’t afraid to hold anything back, sets its pace, and gives us more than what we came to expect. There is one reservation I have about the movie, however. Even though the most appealing characters are included in the necessary simple ensemble, there are quite a few of the good ones missing, such as: Colossus, a mutant who can change his body into complete metal; Beast, a man with thick blue fur covering his body, and a mind that scientists would love to study; and Juggernaut, a villain whose superb strength (not to mention body armor) makes him a highly formidable opponent in combat. Undoubtedly, though, this will be remedied by the already-planned sequels to “X-Men,” so maybe there’s no sense in holding this against the picture. I do not question that fans of the “X-Men” pages will easily be impressed with the screen treatment; the visuals, the cinematography, the pace and plot are all firmly established, seldom borrowing from the source material so that even non-fans of the series will be able to understand it successfully. It’s the character introductions, however, that give the movie its backbone, and they have been cast with actors that look, and embody, the personas faithfully. “X-Men” will hopefully prove to be the foundation for which Twentieth Century Fox can build a successful film franchise using the comic books as the motivation. Let’s just hope this doesn’t turn into a fiasco like the “Batman” series did.